United Technologies (UTX) is one of America's oldest and largest industrial conglomerates. That business model has served income investors well, with the company recently becoming a dividend aristocrat by announcing its 25th consecutive annual dividend increase and also boasting a track record of paying uninterrupted dividends since 1936. However, on November 26, 2018, the firm announced plans to break up into three separate companies, which sent shares plunging as much as 6% on the news. Let's take a look at why United Technologies is splitting up its business units and what it means for long-term dividend growth investors who hold the stock. Management says this will be a tax-free spin-off and believes the breakup to be completed within 18 to 24 months (most likely in 2020). The company expects $2.5 billion to $3 billion in one-time separation costs. The ratio of shares that existing investors will receive in each company has not yet been announced. Nor has each company's respective liabilities (debt and pension obligations), though management has said all three businesses will retain investment grade credit ratings. For these reasons, it's somewhat challenging to draw any immediate conclusions about which actions, if any, conservative investors holding UTX shares should consider taking. However, we can take a closer look at management's rationale. Given the company's excellent long-term track record of creating value for shareholders, why is United Technologies planning on separating into three independent businesses? There are several reasons why companies embark on spin-offs, one being that conglomerates often trade at a discount to the estimated value of their standalone parts. Valuing complex businesses is more challenging, and cyclical segments such as air conditioning systems (tied to real estate) can weigh on the valuation a company's premier assets like aerospace would otherwise receive on their own. Activist investors such as Bill Ackman and Dan Loeb (hedge fund managers) have been pressuring management to break the company up to unlock the intrinsic value in its individual business units. Separating the aerospace, elevator, and building systems businesses accomplishes that goal, although we won't know how the market will value these standalone companies to see if value is truly unlocked until they begin trading on their own. Besides hopes of unlocking value, splitting up a conglomerate is also sold as a way to improve the management of each business unit. During the firm's second-quarter earnings conference call, for example, CEO Greg Hayes told analysts, "What we have heard is that people prefer focus." Breaking up United Technologies is management's attempt to give investors what they want on the theory that separately run companies will be more focused and thus effective at driving long-term revenue and cash flow growth. After all, each of these businesses is very different from the next. From end markets and geographies served, to capital intensity, investment horizons, and overall profitability, there are plenty of unique management considerations. 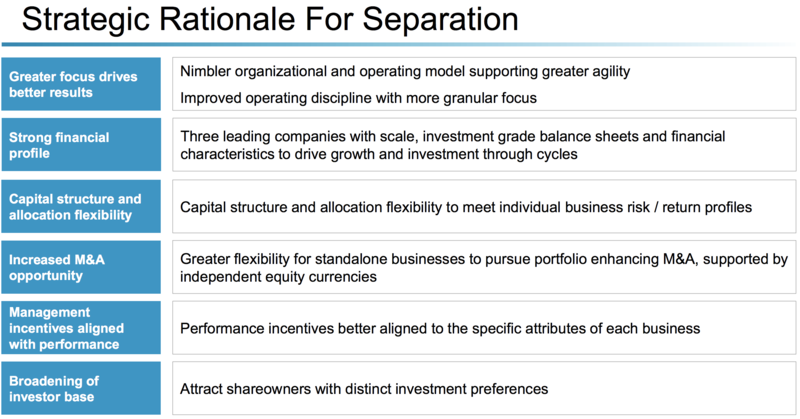 Different types of shareholders will also be attracted to each standalone firm. But what about dividend investors? They don't necessarily care about "maximizing shareholder value" like hedge fund managers, but rather just want a safe and steadily rising income stream. Let's look at what the split of United Technologies means for them. While there may be theoretical benefits to this breakup, which possesses some qualities of successful spin-offs, there are also some downsides. Specifically, a key reason companies grow via mergers in the first place is the theoretical cost synergies created by eliminating duplicate costs such as staff, office space, and IT infrastructure. In fact, one of the reasons United Technologies gave for buying Rockwell was the $500 million in cost synergies expected to be generated within the first four years. Breaking up a conglomerate can have negative synergistic effects, both in the short and long term. For example, during the spin-off conference call CFO Akhil Johri told analysts to expect one-time tax costs of $2.5 billion to $3 billion from separating around 1,200 legal entities United Technologies has globally. Over the long term, setting up separate IT systems for the three companies is expected to result in $350 million in additional annual overhead expenses. This nearly offsets the Rockwell Collins synergies that management has promised and which are far from guaranteed. In addition, investors should know that that $350 million in additional overhead is up from an earlier estimate of just $200 million Hayes gave analysts in February, when discussing a possible future breakup. It also remains to be seen how each business will perform on its own without the others to help cushion its results. These standalone companies will likely be far more scrutinized, and, for better or worse, each firm will have greater sensitivity to the factors that drive its business. "Following separation, the three companies together are initially expected to pay a quarterly dividend that is in sum no less than 73.5 cents per share, although each company's dividend policy will be determined by its respective Board of Directors following the completion of the separation. Until the planned transactions are completed, UTC expects to continue to pay a quarterly dividend of no less than 73.5 cents per share." While the lack of an aggregate dividend cut is good news, each business will have a different dividend profile that investors will need to review. The remaining United Technologies (aerospace) will arguably have the most attractive qualities given its solid profitability and lower cyclicality. However, it's too soon to evaluate each company from a dividend safety and growth perspective since few details about their financials and capital allocation plans are available today. So does this mean that the spin-off is bad for dividend investors? It certainly complicates things, and the ultimate outcome will depend on whether management's theoretical "stronger focused businesses" actually perform better on their own than under the same umbrella. 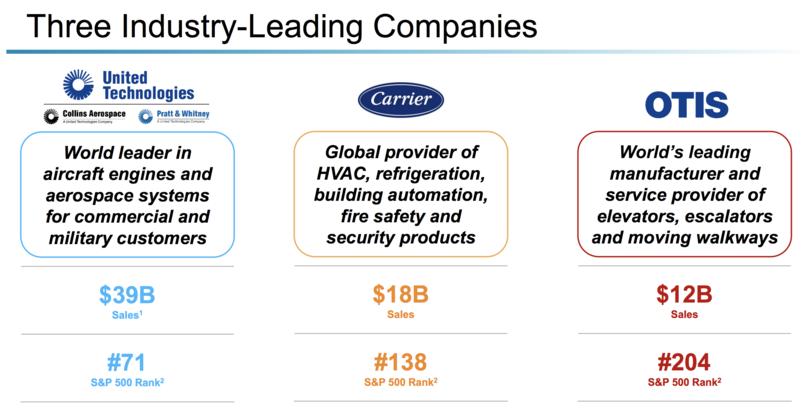 There is no guarantee that Otis and Carrier will in fact perform better over time compared to when they were under the same umbrella as aerospace. Higher overhead costs are a guarantee, which likely means that the combined three companies' free cash flow will, at least initially, be lower than it was without a breakup. As a result, the cumulative dividend growth rate for all three businesses could be lower than United Technologies' most recent 6% increase (which is down from a 20-year average of 11% per year). However, management deserves the benefit of the doubt for now. The company has delivered decades of impressive results, and it's worth giving this latest decision some time to play out. It's understandable why income investors might be worried about United Technologies' confusing breakup. After all, the company has spent over 80 years building up an ever-larger collection of businesses under the guise of synergistic cost savings and diversification. Now, management wants to "de-unite" the firm's business units and take on higher overhead costs in favor of theoretically better individual business unit performance (from smaller, more focused management teams) and higher share prices, which are far from certain. While these plans create some uncertainty over the coming 18 to 24 months, at the end of the day United Technologies still represents a good collection of wide-moat assets. More importantly, the overall dividend will remain safe, though the new United Technologies, Otis, and Carrier might no longer be considered dividend aristocrats as their capital allocation plans evolve. In the future, for example, Otis and Carrier may decide to not grow their dividends every year, should the cyclical nature of their smaller and more focused businesses not allow it. If you own United Technologies now, there is not necessarily a significant reason to sell it, unless you feel that management's major shift in corporate strategy means a weaker dedication to future dividend increases (including at Otis and Carrier). While we don't hold shares of United Technologies, our personal preference in a situation like this would be to hold on until more information is available to evaluate each of the three separate businesses. At that time, more clarity will be provided about each company's risk profile and capital allocation plans to gauge whether it is an appropriate long-term holding.